Caarte, van Neufchatel et Valangin. A stunning map of Neuchâtel, Switzerland first drawn by Daniel de la Feuille in 1706. Depicts the stunning Lake of Neuchâtel and the surrounding region. Neuchâtel, located in the Canton of Neuchâtel, is Switzerland's largest lake. Twelve tiny ships sail on the lake. Title cartouche in the lower left quadrant features the 18 armorial crests of the heirs of Fredrick, King of Prussia. The lower right quadrant offers a stunning view of the town of Neuchâtel and beyond it the Lake. On left and right side of the view are engraved representations of Peruses and Hercules, respectively. At the bottom center a map scale appears on a large pedestal on top of which a cherubic figure uses survey equipment beside a map and globe. This is Paul de la Feuille's 1747 reissue of his father Daniel's 1706 map. Prepared for issue as plate no. 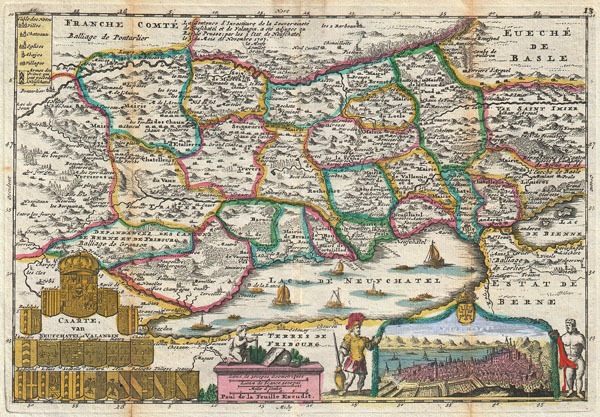 15 in J. Ratelband's 1747 Geographisch-Toneel. Very good condition. Minor discoloration along original foldlines. Original platemark visible.